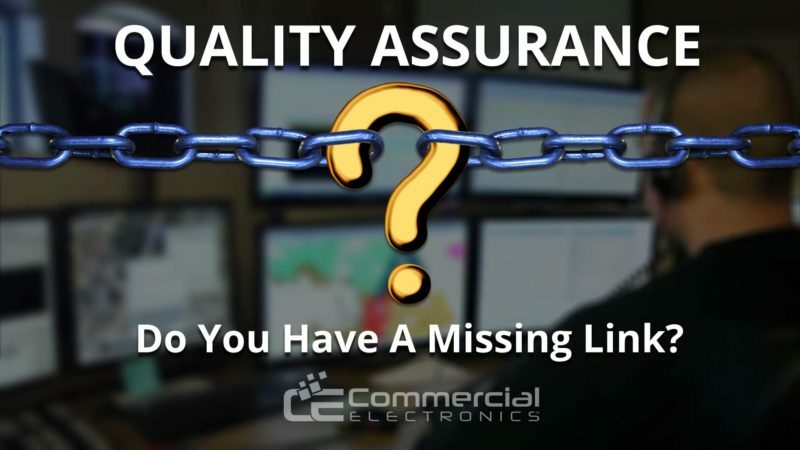 Quality Assurance: Do You Have A Missing Link? Home/Quality Assurance/Quality Assurance: Do You Have A Missing Link? By Beth English|February 5th, 2019|Quality Assurance|Comments Off on Quality Assurance: Do You Have A Missing Link? It was a cool spring night just after 9 p.m. when the 9-1-1 call came in. On the line, a woman desperately begged for help as she watched her friends being shot to death. While describing the scene to the 9-1-1 operator, she said that her friend had been shot and then provided the address of the location. They were living in a homeless camp in an abandoned barn on the property. As she gave this information, the operator heard a shot in the background along with the voice of the killer saying, “Another one dead”. The operator heard one more shot before the line went dead, presumably the shot that killed the caller. Officers arrived on scene and searched the area for the victims. They were unable to find anyone. In that time, another 9-1-1 call was received from a neighboring subdivision. The caller told the 9-1-1 operator that she had heard shots, and mentioned the abandoned barn on the property, suggesting that officers check the location. Officers were never told about the barn or the fact that shots were heard during the phone call. They also never knew there was an armed subject still in the area. The quality of service you, as a 9-1-1 telecommunicator, provide is extremely important. It can mean the difference between life and death. Mistakes come with severe consequences. As a result, many of your completed tasks pass through Quality Assurance via mandatory double-checks, validations, and audits. When a citizen calls 9-1-1 for help, the first thing you ask for is the address. After all, if you don’t know where to send help, the rest of the call doesn’t matter, right? Then, after obtaining the address, you confirm the address, either by repeating it back to the caller or having the caller repeat it back to you. That’s one link in your Quality Assurance chain: ensuring you have the correct location. Next, you ask for the phone number. If you get disconnected, you want to be able to call them back. You can consider the phone number verified if it matches what the ANI/ALI screen displays. If not, you ask them to repeat the number. Another Quality Assurance link. For crime reports, there are several QA points between the agency and the state and national databases. For instance, when you enter something/someone as wanted or missing, there are certain steps you take to do Quality Assurance. Every entry is double checked. Every entry is validated annually. The state audits your entries every three years. Again, more Quality Assurance links. So, why do calls, like the one above, happen hundreds of times every day? It’s because of a missing link in the Quality Assurance chain. Many of the calls you handle can mean the difference between life and death. Isn’t quality assurance for 9-1-1 calls and dispatched radio traffic as important as entering property into crime databases? Here are two examples of where QA can identify a training issue before a tragedy occurs. A death occurs because a call taker fails to verify the address displayed on the ANI/ALI screen. Units are sent not only to the incorrect location but also to the incorrect jurisdiction. With regular Quality Assurance, this training issue would have been quickly identified. This death could have been avoided. A responder gets mortally injured because a dispatcher failed to convey weapons information. With regular Quality Assurance on radio traffic, the responder could return home safely to his family. Again, Quality Assurance could have prevented this tragedy. The media outrage to either example would be immediate, and the lawsuit inevitable. Which would you rather invest in: Quality Assurance or a lawsuit? If you aren’t doing QA on phone calls and radio traffic, consider it. Don’t be compromised by missing this important link in your QA Safety Chain. In 2015, APCO and NENA released a standard to establish a Quality Assurance and improvement process. This ensures call taking and dispatch procedures deliver the highest standard possible across the board, from state to state, agency to agency. All the steps for creating a Quality Assurance program are readily available to you… what’s stopping you? Do you need assistance to improve or implement your Quality Assurance? Check out CEQUIP from Commercial Electronics. We assist Public Safety Communication agencies with experienced 3rd-Party Call Review, Refined Protocols, Quantitative Results for Coaching and more. Stay tuned for my next discussion in which we will discuss some surprising things QA can reveal about your center. Hint: it’s not all bad! Interested in our Quality Assurance service? After 31 years as a public safety communications profession, Beth English is a believer in PSAP QA. She has seen firsthand, the positive effects QA can have on an agency, both internally and externally. Beth is also a popular trainer and regularly presents at state and national telecommunicator training conferences on topics that have included contingency planning, public education, employee recognition, in addition to productive and constructive criticism. She has earned her Master Telecommunicator Proficiency Certification from Texas Commission on Law Enforcement (TCOLE) and is an active NENA volunteer including serving as President of the Texas Chapter. At Commercial Electronics, Beth oversees the QA program, CEQIP and provides HighGround Training.